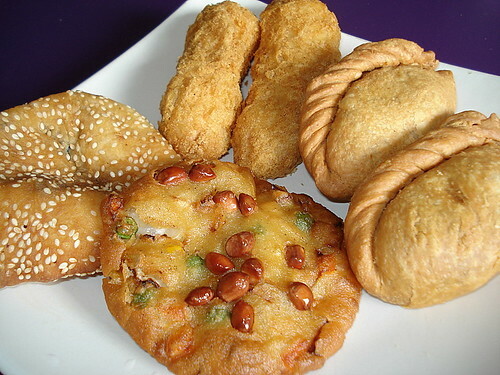 From top clockwise - Banana fritters, curry puffs, vegetable cake and sesame topped hum chim peng, originally uploaded by Camemberu. Packed home some tea-time snacks from Xiang Ji Fried Banana, which sells an assortment of deep-fried items (most are about S$0.70). These are best eaten hot. Tastewise most of them were passable. All reasonably OK but nothing truly spectacular. However, the curry puffs sprung a surprise from the very first bite. It was a dense, heavyweight item with a spicy filling redolent of sweet potato and possibly five-spice powder. Hmm, seems a love it or hate it thing. Xiang Ji Fried Banana, originally uploaded by Camemberu. Anyone knows where to find the 3-in-1 fried nian gao. 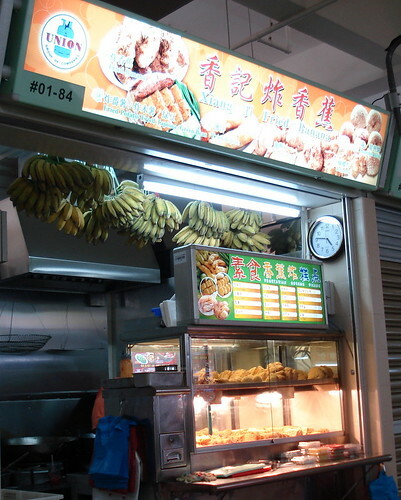 I know old airport rd got one stall named 吃爽爽. The 3-in-1 means that the nian gao is sandwiched with a slice of sweet potato and a slice of yam. The fried durian is nice too. Anyone knows how to make the deep fried batter for the banana and nian gao? Other than old airport 吃爽爽，they also have a branch at Chinatown Smith street.. Newly open on 1st June.. Went to eat it other day,it taste as good as the main branch. If you are lazy to go till Old Airport road,jux head down to Smith Street Chinatown Hawker Centre #02-024..I love their Fried Durian & 3-in-1 Nian Gao..everyone shld try!! Looks like it could be useful. Rite Pizza - whopper size cheesy pizzas! First formal dinner entry for this blog! How bad can pasta get?